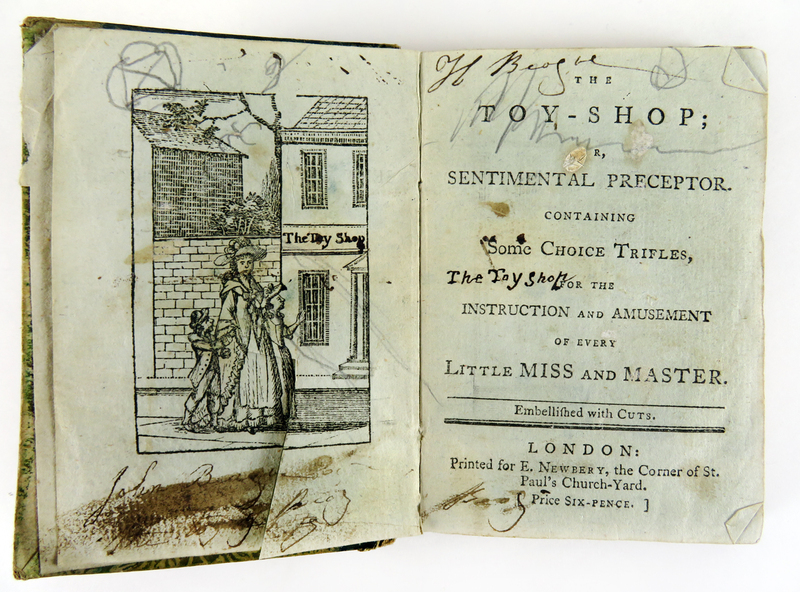 This copy of The Toy-Shop is a good example of a book that has almost been read to death. Who was responsible? It’s natural to pin the blame for the book’s poor condition on the owners who wrote their names in it. But H. and John Beague were probably just two in a succession of owners. 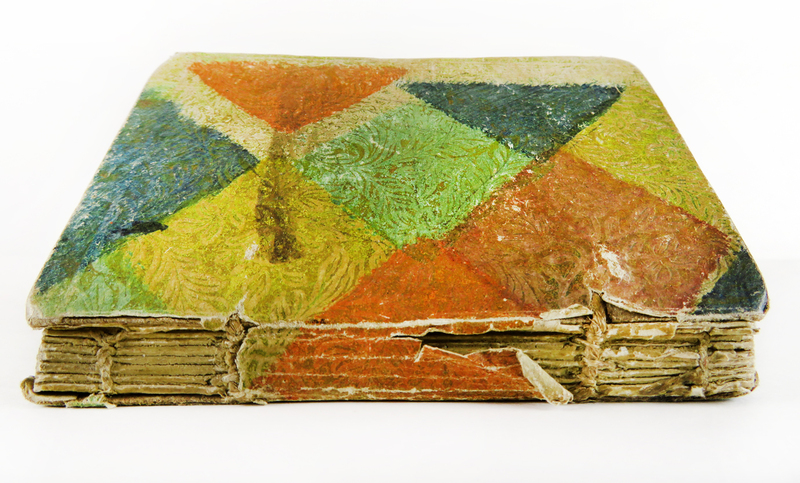 It’s possible that the damage was done by one of the owners who didn’t identify him or herself or whoever scribbled in pencil throughout the book–possibly as late as the nineteenth century. Maybe it was more than one bad actor. 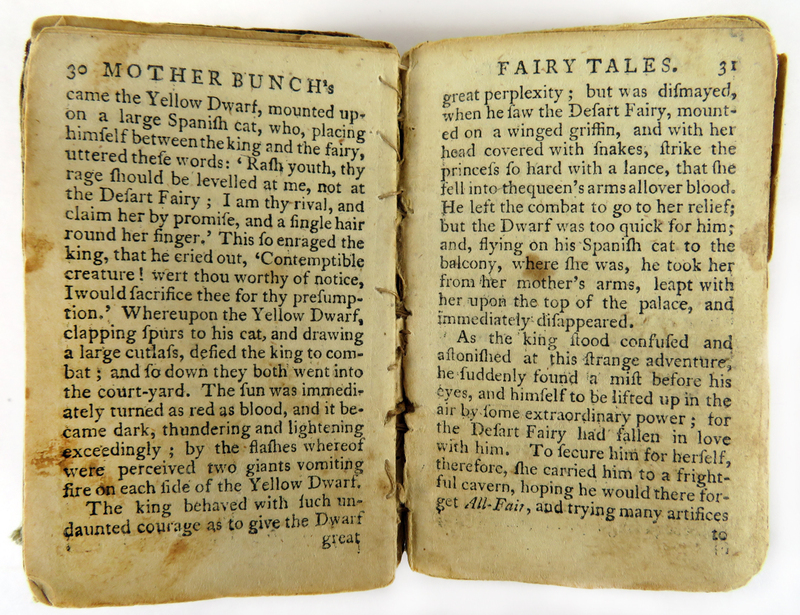 The binding of the The Toy Shop should be a wreck, but the Dutch gilt paper over boards is in better shape than the text. 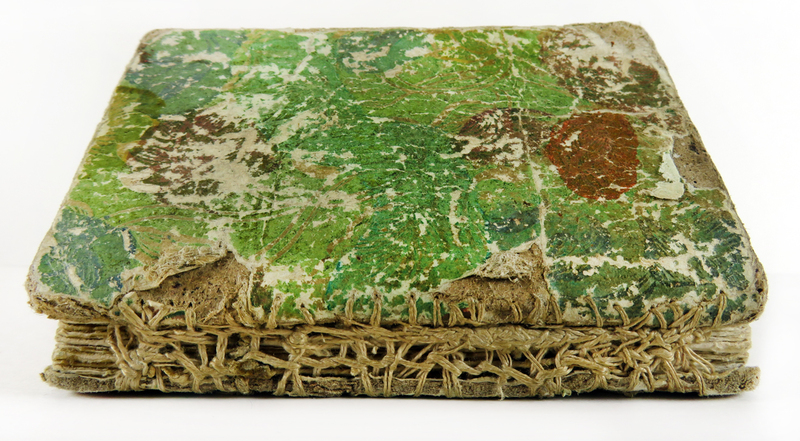 Really well read copies of eighteenth-century juveniles bound this way often have naked spines, exposing the stitched signatures below. Where the paper covering the spine is torn away, you can see how thin it is..
Front board and oversewn spine of Cotsen 5505. 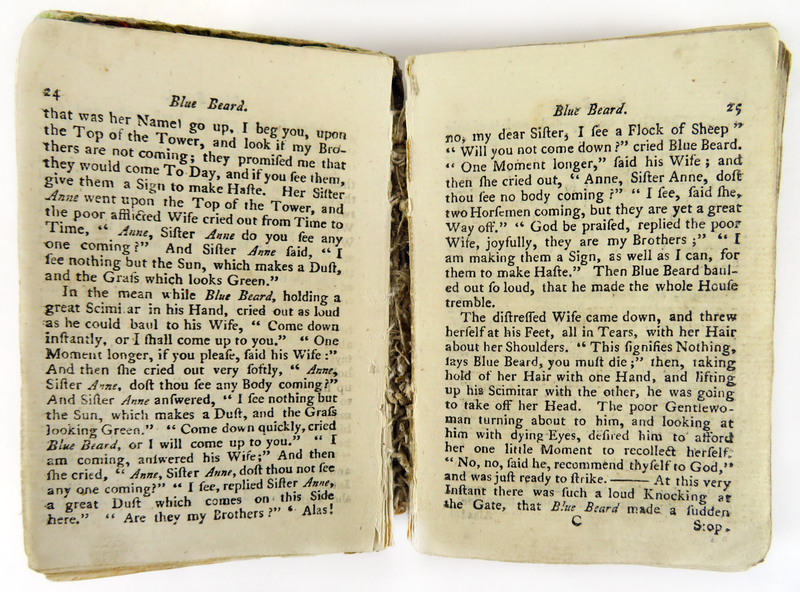 Some young readers actually cared enough about their books to reinforce the bindings, but there’s no way of knowing whether it was the owner or a kind sister or mother who stopped what they were doing and repaired the book. 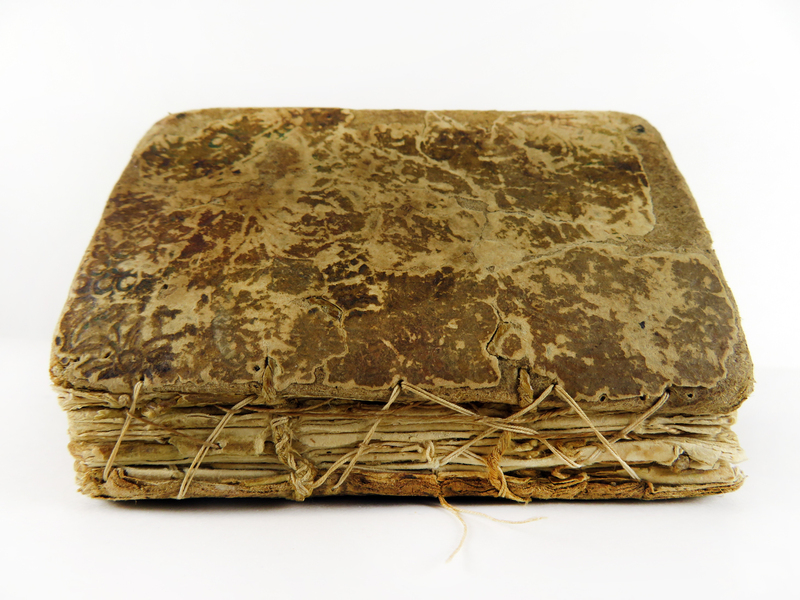 This binding is so worn that it’s impossible to tell what the original color of the paper covering the boards was. The spine is completely gone, although some of the original stitching holding the two boards together is still intact. Someone did a rough-and-ready job of securing them so they wouldn’t fall off. 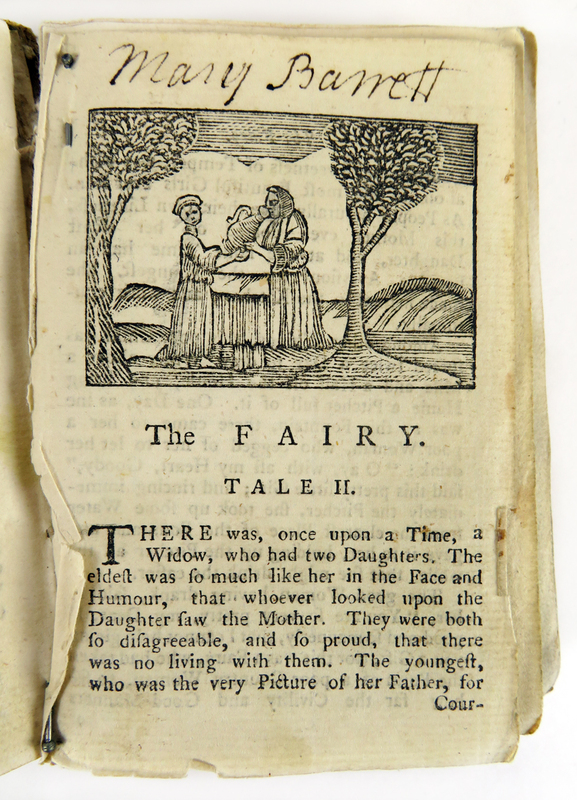 The repair is not neat or precise, but the collection of then popular fairy tales by Mme. D’Aulnoy and others can still be opened and read. The book is a 1790 reprint of a title issued nearly twenty years before. The engraver’s signature is long gone and the images are so worn that they have been touched up in places. On the inside there have been additional repairs to keep the pages from falling out. The first owners of Cotsen 5505 that can be traced lived in the middle of the nineteenth century. 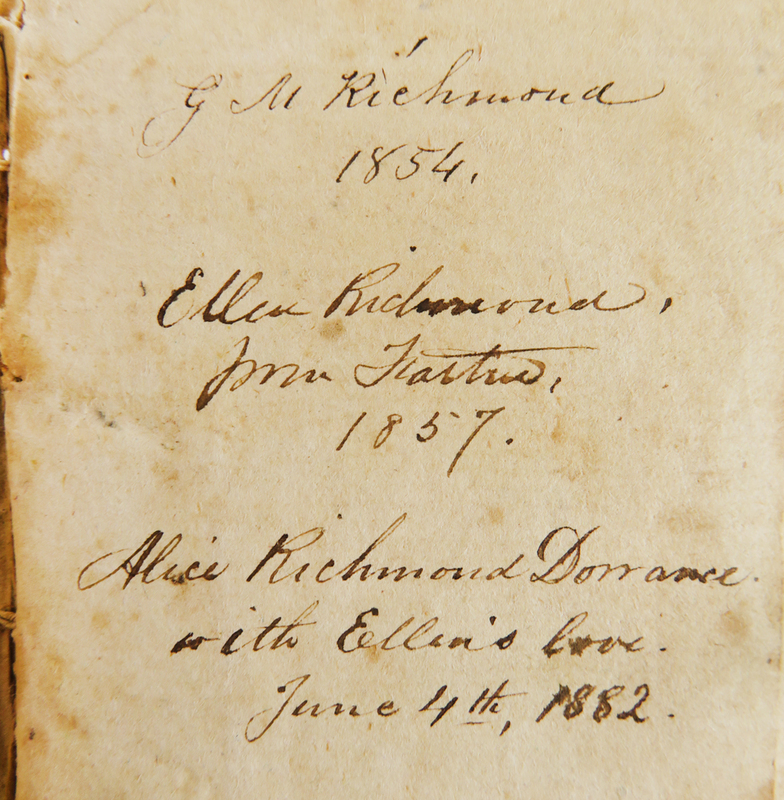 In 1854 this copy of Mother Bunch’s Tales was signed by G. M. Richmond (George Martin Richmond, a businessman in Providence, Rhode Island) and he gave it to his adult daughter Ellen in 1857. Nearly twenty years later Ellen presented it to her married daughter Alice. Did one of them sew the boards back on or had that been done long before it came into the family? There must be a story about this book, but it is impossible to tell from the information Jill Shefrin discovered in the course of researching the people who owned Cotsen’s collection of Newbery juveniles. The third example below must have been read until the boards had fallen off, but someone cared enough about it to oversew the binding with stout thread with an interlocking stitch. 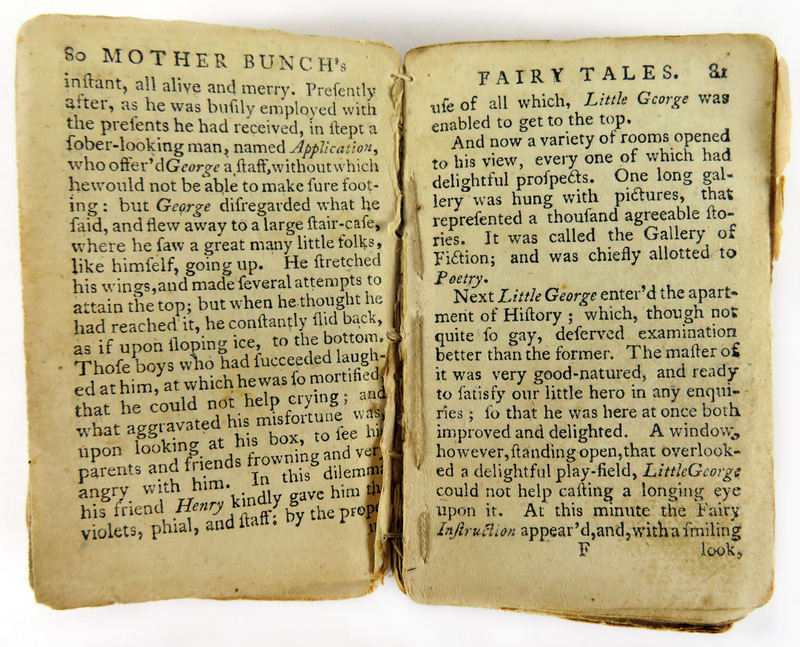 Other eighteenth-century children’s books in the collection have been repaired the same way, although I don’t have a list of them. Front board and spine of Cotsen 25150. .You can get a glimpse of the stitching on the inside as well. 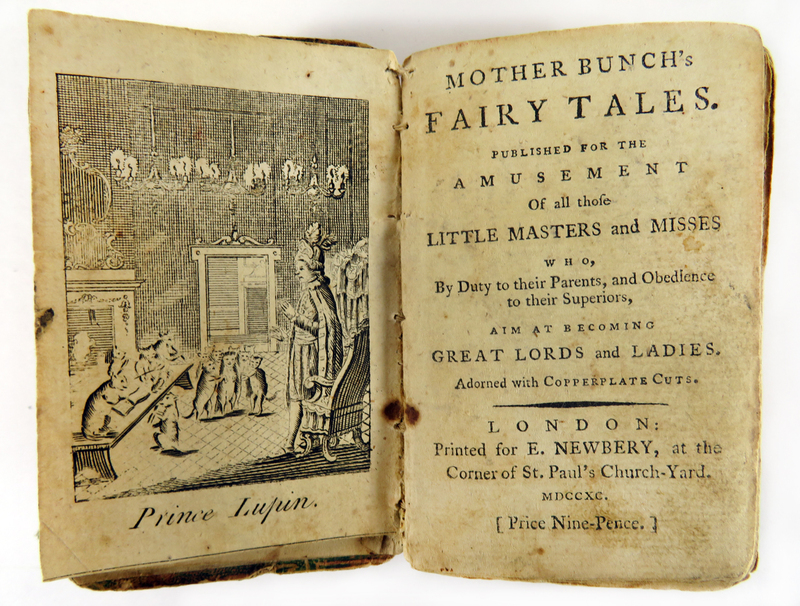 This entry was posted in 18th century, Annotations in books and manuscripts, Bindings, Book history and bibliography, British children's books and tagged Benjamin Collins, Binding convservation, Dutch gilt paper, Ellizabeth Newbery, Histories or Tales of Past Times, Mother Bunch's Tales, Mother Goose's Tales, Newbery and Carnan, Richard Johnson The Toy Shop by Andrea Immel. Bookmark the permalink. An unusual angle of analysis but a very important and intruiging one. Great posting, interesting and informative!